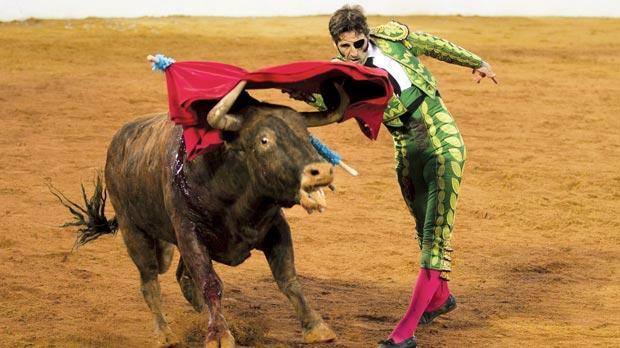 I know you are a bullfighter, and you love your work. It is most likely all you have ever done and all you have ever wanted to do. You are a professional with years of experience and you make your living doing this. It is how you feed your family. You want your children to be proud of you every time you step into the bullring. I love the suit you wear to work. I sincerely believe that there is no other job, no other occupation, vocation or mission that wears such beautiful garments. There is a good reason it is called a “traje de luces” or suit of lights. I especially like the pink stockings and black ballet shoes with bows. In a job where steel-toed boots would make sense the shoes add a balletic quality to the stages or “tercios” of a bullfight. Only a very brave man wears this suit. Your field of endeavor has a history, a long and colorful history made famous by admirers of the sport like Picasso and Hemingway, some of the greatest artists of the 20th century. Moreover, it is part of the history and tradition of your country. National pride resides in every step you take in the ring. And yet, in spite of all of this I am asking you to change the course of history. It can be done. It has been done before. On October 8, 2011 you were gored by a bull. You had just placed two more banderillas (colorful barbed lances) in its back and then, in an instant, you did what we have all done before but with dire consequences, you stumbled. In that moment the bull did what bulls do, what any animal would do, what instinct and unspeakable pain and torment compelled it to do, it struck back. It took its horns and pinned you to the ground. The left horn entered below your left ear and emerged somewhere near your left eye socket. In the video and photographs it looks as if your eyeball is actually pushed out of the socket by the bull’s left horn. It is a video of unparalleled violence. During your recovery you vowed to re-enter the ring. In an interview you stated it was because you wanted “to win, to triumph, to be a better man.” To this end you were willing to don the suit of lights and place your life in danger once more with fifty percent less vision and one hundred percent more resolve. That day has now come and gone. You entered the ring and killed again. You are a very brave man indeed. Now I am asking you to re-direct that bravery, to consider the tremendous opportunity before you, the opportunity to take the world as it spins and make it spin another way. Very few people ever have this opportunity so perfectly placed before them. The choice to accept and promote bullfighting is ideological. My country waged a war against itself because of ideological differences and brother fought brother because each believed he was right but the truth is, only one was right. In my country we once considered slavery a morally acceptable practice. We now know we were wrong. One hundred years later we were still battling whether black and white children could be educated in the same classroom. Again, people died in order to solve this moral crisis. Progress requires struggle, and leaders. What I am asking you to do is no less historic. Not because I think animals are as important as people but because no nation that tortures and mistreats animals for sport can stand among the civilized nations of the world and look another in the eye. No doubt you will feel opposition. No doubt you will be alienated and ostracized by some of your peers. I cannot change that. What I can do is offer you a hand, a strong and guiding hand made up of the millions upon millions of individuals who feel that the era of blood sport is over. The time of killing animals for our own amusement is behind us. I am asking you to place your name among the honor guard of history. The men and women who protect the innocent, who are willing to give up everything they have, everything they have ever known, to turn the course of history and march in a different direction, toward goodness and honesty, kindness and compassion. It is for this very reason that I call upon you, not to hang up your suit like some aged shogun. Instead I am asking you to re-imagine your role, to take up the battle against violence toward animals. Let’s put an end to cockfighting, organized dog fights and poaching of endangered species in Africa, South America and Asia. Put down your banderillas and daggers and let’s take up the flag of non-violence toward animals. Let’s establish the World Federation of Matadores and kill the ignorance that wreaks havoc on innocent animals all over the world. Let’s protect the creatures of the earth from poachers and march toward a new future, a future free of needless violence. Let’s use bullrings for concerts and football games. Let’s act un-selfishly, and save the animals, not kill them. Let’s change the course of civilization together and I guarantee, you will be the most famous bullfighter in history.